In 2010 a fall from a second story window nearly killed me. I broke my back and the damage to my spinal cord left me paralysed from the waist down. From the moment I hit the ground, I joined a global community of people that according to the experts, have no hope of recovery from complete spinal cord injury. But what if the experts are wrong? Only 60 years ago, patients with a spinal cord injury had an 80% chance of being dead within a year. The 20% who survived were likely to be institutionalised. But in 1940s in England, Doctor Guttman wasn’t prepared to accept the status quo, and he founded the first spinal unit in the world at Stoke Mandeville Hospital. His work transformed spinal cord injury from a death sentence to a manageable injury with near normal life expectancy. So why not a dramatic change in prognosis now from ‘no chance of further recovery’ to ‘some functional recovery’ in the next 60 years? The answer I suspect lies somewhere in the misplaced fear of offering false hope. As I lay in the spinal unit that Guttman created navigating the psychological chasm between acceptance and hope, I was presented with an expert view from one of the senior medical team that hoping for recovery was proven to be psycologically damaging. I simply don’t agree with that analysis. I understand that hoping for a cure without first facing up to the reality of paralysis might lead to an avoidance of learning the physical and psychological skills to live life as a wheelchair user. I have accepted the wheelchair. It is almost impossible not to. Yet acceptance without hope runs contarary to my experience of dealing with blindness 12 years earlier, and subsequently racing to the South Pole. And I believe it stifles our ambition to progress. So, I also hope for another life. A life where there is a cure for spinal cord injuries. And in the spirit of Guttman, I am challenging today’s conventional wisdom in an effort to turn that hope into a reality for me, the global community of spinal cord injured people with no hope, and the ones who will join us in the future. To this end, I am exploring the possibilities of recovery using my own body as a research subject, as I train for 2 to 3 hours daily. There are a growing number of therapies, technologies and products that sit outside the traditional acute and rehabilitation system and I am using many of them to test their effects. 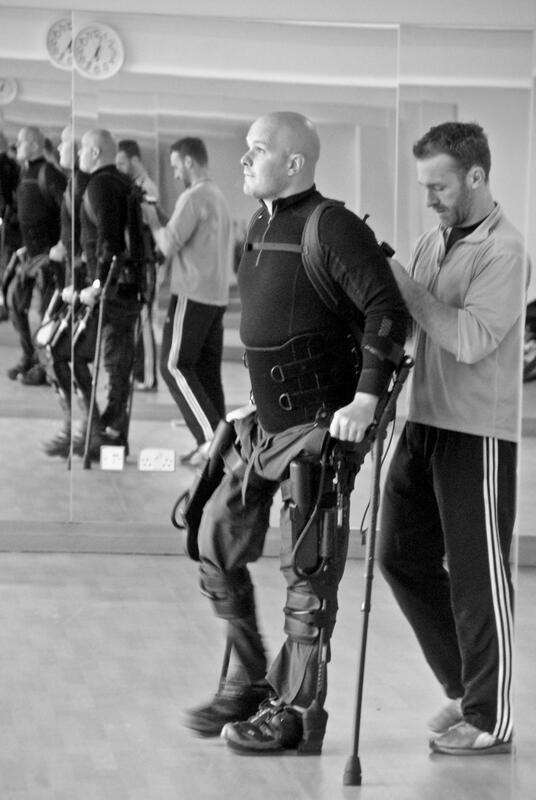 I am following an aggressive physical therapy programme, cycling on a functional stimulation bike and walking in an Ekso Bionics robotic suit. Also, with the help of many thousands of supporters, I have been in a position to fly to different countries to test some of what is available around the world. But others are not in a position to do so and almost none of the advanced therapies and technologies that I use daily are available in mainstream medical facilities. So, I am making my body available for research and capturing the data with the aim of mainstreaming what is currently on the fringes. The cure for spinal cord injury simply requires enough of the right people having the will to make it happen. Even if I do not walk again I believe others will, if enough of us explore the gap between reality and fantasy in pursuit of a cure. It is time to disregard the impossible. If not us, who? If not now, when?